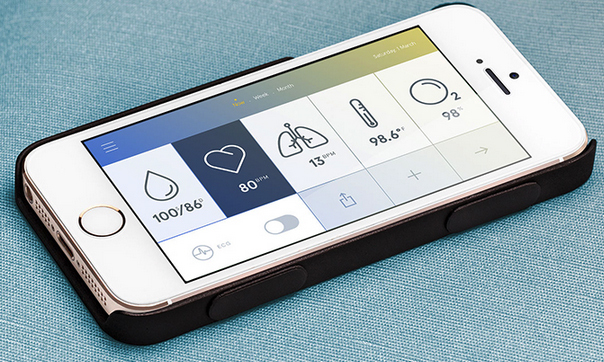 Science and technology company Azoi has unveiled the Wello health monitoring case for the iPhone 4S, iPhone 5 and iPhont 5s, allowing users to track various human metrics such as blood pressure, heart rate, temperature and more, reports GigaOM. The case itself features a thin design with Bluetooth functionality, and includes a microprocessor along with two sensors on its rear. Users are able to measure their health metrics by placing two fingers over designated holes on the back of the case, with a reading taking a few seconds and appearing on a companion app. Azoi states that the Wello can sync with accessories such as a Wi-Fi scale and other fitness trackers, and contains a battery that lasts up to two months on a single charge. The accessory also allows multiple users to register their health metrics through the app, as health trends and patterns will be displayed over time. Apple is rumored to be including health tracking functionality similar to the Wello in its wearable iWatch device, which is reportedly in development for a release later this year. A report earlier this month stated that the iWatch could perhaps incorporate optical sensors to measure physical functions such as heart rate and oxygen levels, as Apple is rumored to be including a"Healthbook" app in iOS 8 that would assist users in tracking health statistics in conjunction with the iWatch and iPhone. The Wello is available to pre-order for $199, as Azoi plans to launch the product later this year pending approval from the United States Food and Drug Administration. Those who pre-order early will also receive a free spirometer attachment to measure lung functions. I know I have seen this guy somewhere before..... Oh yah! He also makes Coin! Not sure why it has to be a case -- wouldn't it be more flexible if it were a separate bluetooth connected thing you could stick in your pocket & take with you only when you want it? Doubling as a (probably not very good) case doesn't make much sense to me, especially as it won't work with all generations of iPhone, as others have pointed out. If true, that is absolutely amazing. Makes me very anxious for the iWatch and its possibilities, especiall as a gym junkie and a person who is making strong efforts to become a healthier eater. wow! this is really cool! why does apple take ages to bring something as simple as this? very nice advert too! They want you to order now to maybe get it by fall. But by then the iPhone 6 and possibly the iwatch will be out or nearly so and either one may track health. Also that case likely won't work with iPhone 6. I think they realize this and are trying to get your order now before they have to compete with Apple. The only problem I have with this is you need to actively put your fingers on the sensors to perform the test. A system where you were constantly being passively monitored and notified when your 'vitals' indicate a problem would appeal to me a lot more. The biggest problem here is the iPhone6 will be available by the time this product comes to market. Do they really expect that the user this appeals to will continue to use a previous generation phone? Some folks may want a case-based solution, but Wello needs to make another version that does not attach to iPhone.